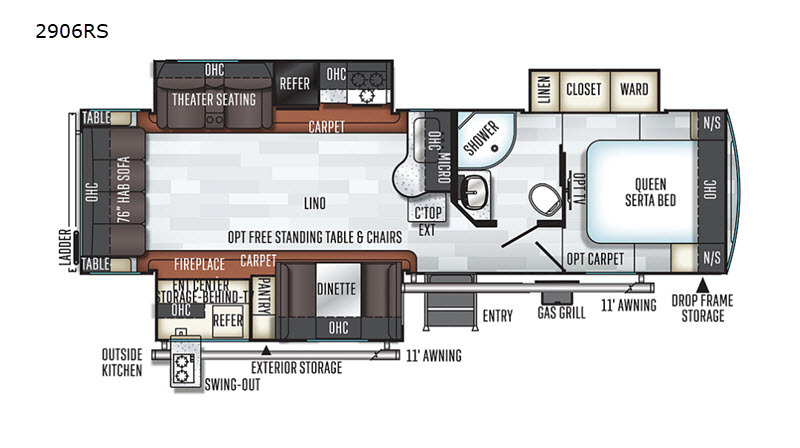 If you have been dreaming of traveling in comfort with everything you need to stay at your favorite campground for a weekend or longer, then this Forest River Rockwood Ultra Lite 2906RS travel trailer might just fit your dreams and needs perfectly. 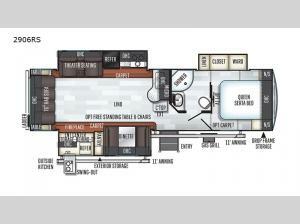 You will enjoy having your own space in the front private bedroom with a queen Serta bed that has nightstands on either side, a slide out with a wardrobe and closet, and an entrance into the dual entry bath, plus you can add the optional TV for those late nights when you just can't fall asleep. You will find sleeping space for your kids or grandkids on the booth dinette and the 76" hide-a-bed sofa once prepared for the night. You might even fall asleep in the theater seating if you sit there long enough in front of the fireplace. The chef can wake up the next morning to make breakfast on the outside kitchen or inside with the full amenities including a countertop extension!